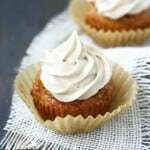 Home » Dairy Free » Pumpkin Spice Cupcakes with Cinnamon Buttercream. 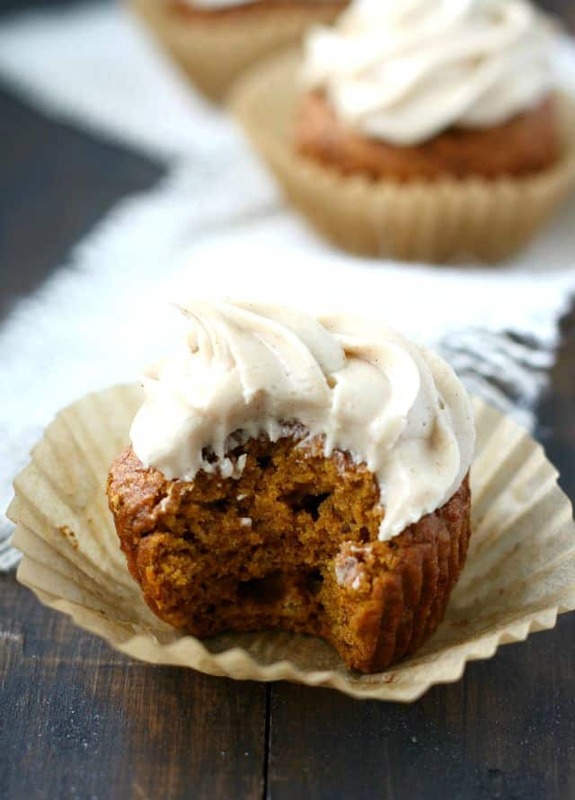 Pumpkin Spice Cupcakes with Cinnamon Buttercream. 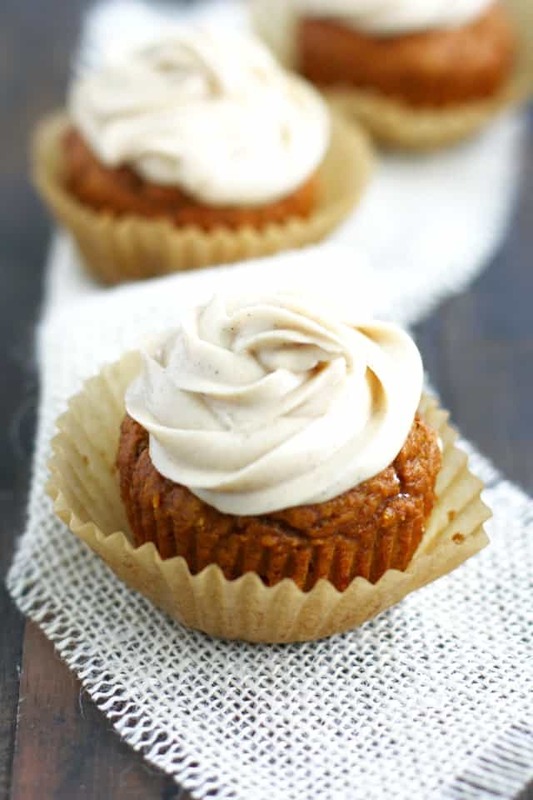 Pumpkin spice cupcakes with cinnamon buttercream frosting are so delicious with a cup of tea! Enjoy these on a cool fall day. Is there anything better than autumn baking? The urge to bake hit me the other day, and I decided on these cupcakes. When in doubt, go with cupcakes. Right? 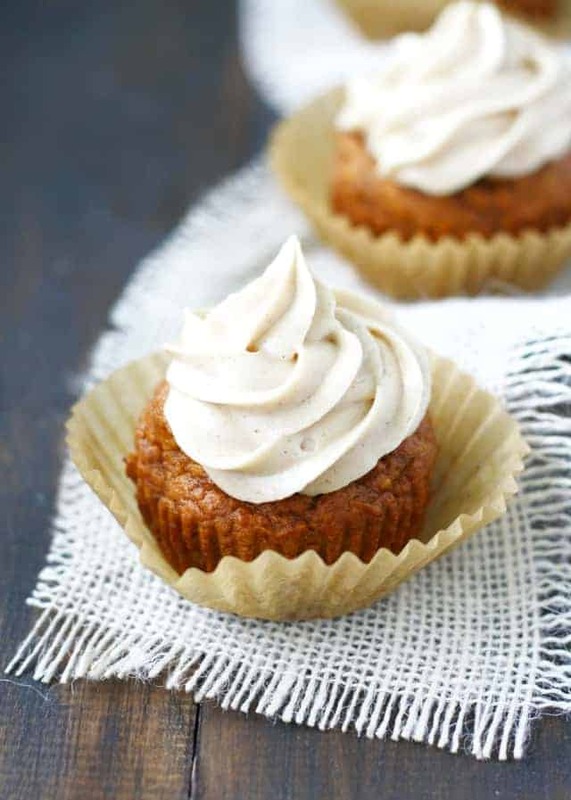 These pumpkin spice cupcakes are really easy to make, and they work well with gluten free flour and regular flour. They won’t rise quite as much with the gluten free flour, but they will still be very tasty. If you’re going to go with the gluten free version, I would recommend trying them with Bob’s Red Mill 1-to-1 Gluten Free Flour Blend or King Arthur Multi Purpose Flour. I also really like these plain, but the boys preferred them with the frosting. (Of course). I recommend using parchment paper cupcake liners for gluten free baking. They’re awesome – they never stick to the cupcakes like other liners do, and they don’t get all transparent looking on the cupcake. (You know what I mean? I hate that). 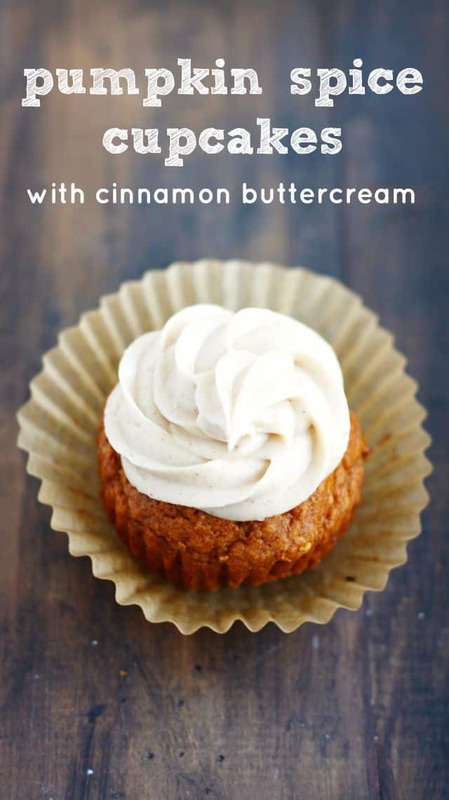 The perfect cupcake recipe for fall - pumpkin spice cupcakes with cinnamon buttercream frosting. 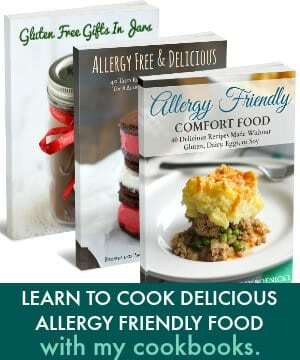 Cuisine Dairy Free, gluten free, vegan. 1½ cups white spelt flour All purpose flour would work, and a gluten free blend would also be okay. Preheat the oven to 350 degrees. Line a cupcake tin with parchment paper liners. In a medium bowl, whisk together the flour, sugar, baking soda, salt, cinnamon, ginger, nutmeg, and cloves. Set aside. In a large bowl, combine the pumpkin puree, organic canola oil, vanilla, apple cider vinegar, and water. Stir well. Add the dry ingredients to the wet ingredients and stir well to combine. Spoon the batter into the cupcake liners, filling them about 2/3 full. Bake at 350 degrees for about 16-18 minutes, or until a toothpick inserted in the center comes out clean. Once the cupcakes are cool, make the frosting. Beat the buttery spread until fluffy. 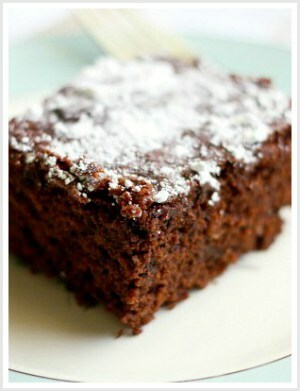 Sift the powdered sugar into the bowl and drizzle in a little non-dairy milk. Alternate adding more sugar and milk until the frosting is thick and creamy. Add the spices and mix again. Spread or pipe frosting onto cooled cupcakes. Store leftover cupcakes in the refrigerator. These are definitely on our list to make again later this fall! Maybe for a birthday party treat. « Vegan Blueberry Oatmeal Pancakes. Do you think this recipe would be enough to make in a tube pan instead of cupcakes? I’m not sure about that if you try it, let me know! How many cupcakes does this recipe tend to make? Do you think I can use applesauce instead of pumpkin? I haven’t tried that so I’m not sure! If you try it, let me know! do they freeze well ? I have not tried freezing these…they don’t last very long around here! ;) If you do freeze them, I would not freeze the frosting, just the cupcakes. These look amazing and given my success with my last baking recipe from you, i have a feeling we’ll be loving these too! My dad’s birthday is coming up and I’m thinking these will be perfect for celebrating. That frosting looks incredible. Thank you! Let me know if you try them! These cupcakes look gorgeous, Kelly! That cinnamon buttercream is just calling my name. What a perfect sweet treat! 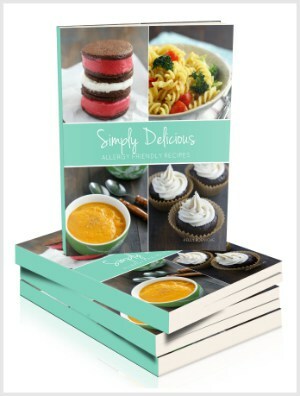 I have so many pumpkin recipes to share this year too, and can’t decide which to share first either! None of them are cupcakes, though, so I can’t go with that. ;) These cupcakes look delicious, and so pretty, too! Haha, yes! I have a backlog of pumpkin recipe too! It is a struggle which on to share first since everything pumpkin is GOOD!